How do you go out with a bang? 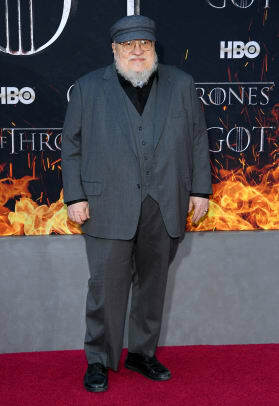 For HBO&apos;s "Game of Thrones," it&apos;s all about throwing a big, flashy red carpet event. The hit series celebrated the debut of its eighth and final season in New York City on Wednesday evening, and the cast — both past and present — made sure to show up in their very best-dressed looks. Stars like Gwendoline Christie and Emilia Clarke wore gowns that made a major statement: Christie, dressed in Iris Van Herpen, showed off the Spring 2019 couture look&apos;s eye-catching florals and billowing sleeves, while Clark arrived in a tulle-covered creation from Valentino. Maisie Williams (in Miu Miu), Natalie Dormer (in Giorgio Armani) and Sophie Turner, who wore Louis Vuitton, opted for classic black evening dresses in lots of shimmery sparkles and sequins. The show&apos;s male actors didn&apos;t shy away from experimental suiting either, as we saw plenty of brocade jackets, turtlenecks and eye-catching details on the red carpet, too. See the rest of our favorite looks from the "Game of Thrones" season eight premiere in the gallery below.